Marbella is the upmarket side of the famous Costa del Sol and has beautiful beaches, great restaurants, history and art. Marbella is the more opulent and posh city on the Costa del Sol and has many attractions, including the beautiful and historic Casco Antiguo, the gorgeous beaches, shops, restaurants, museums and more. Here we explore five of the best locations to visit in Marbella. This area of Marbella offers beaches, luxurious beach resorts, nightclubs and restaurants and stretches all the way to the opulent Puerto Banus marina. 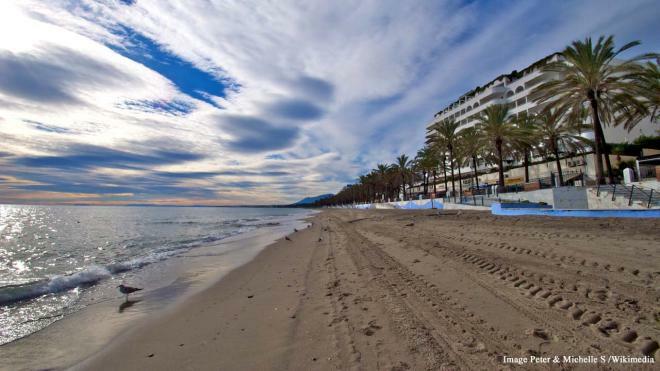 Besides the beautiful “Golden Mile,” Marbella boasts 27 km of well-kept and gorgeous beaches. Most have plenty of amenities, like beach bars, water sports, showers, beach umbrellas and sunbeds, while others are out of the way and perfect for a quiet day of sunbathing. Yet others sport luxurious private beach clubs. Hob nob with the rich and famous in Puerto Banus, with its luxury yachts, high-priced eateries, bars and upmarket boutiques, all backed by the Sierra Blanca Mountains.